The original Excitebike was one of my favorite games in grade school. My neighbors and I would save every penny we could find just to get the three bucks we needed to rent it from the local video store. Despite the myriad of available games for rent, it seems like every other time we got the cash together we came home with Excitebike. Nothing else seemed to compare to it at the time. You can imagine my excitement, then, when I learned that Nintendo would be remaking the game in 3D and giving it away in support of the new 3DS eShop. Modern gamers, however, are a completely different animal than I was back in the 80’s. Will this 26-year-old classic resonate with today’s audience? Does it live up to the rose-colored memories of my youth? The first thing people should know about this game is that, for better or for worse, it is the original Excitebike. This is not some reimagined travesty that barely even relates to the original game. 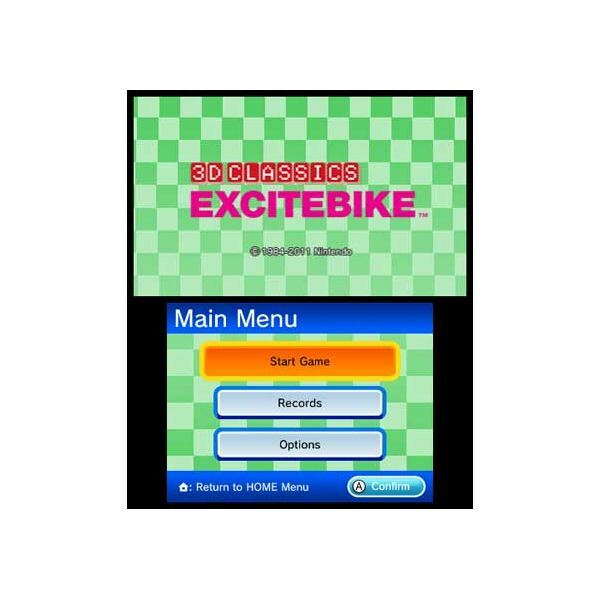 3D Classics: Excitebike retains all the elements of the 1985 classic, they’re just repackaged in 3D. The characters and obstacles are two dimensional, the four-lane gameplay is exactly the same, and the faceless crowd still roars every time you lean too hard on the turbo and overheat your bike. If you have fond memories of sitting motionless on the track, pressing up and down to shift your red rider into the path of his oncoming blue and green opponents, just to watch them wipe out and scurry back to their downed bikes, you’ll be happy to know you will have the opportunity to relive your childhood masochism in 3D. It’s literally as if you plugged a NES cartridge into your 3DS. It’s exactly the same game, just with the option to view in three dimensions. The nostalgia factor here is high. 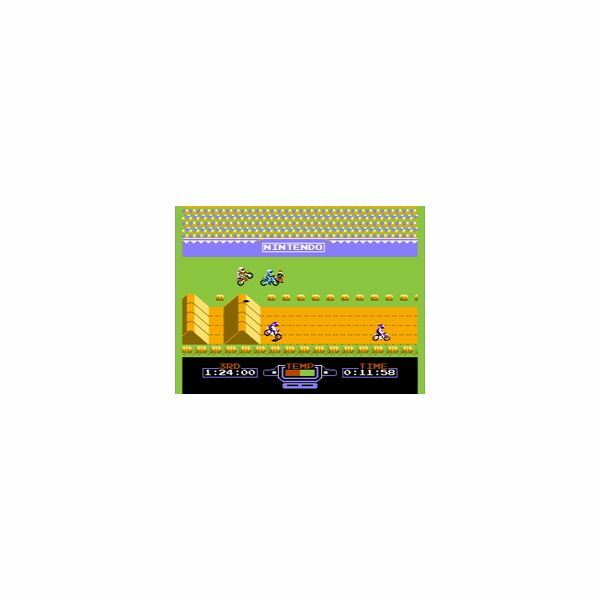 If you loved Excitebike on the NES, you’ll love 3D Classics: Excitebike just as much. For those who haven’t played it, the concept is simple. You race across the screen, left to right, navigating various jumps and obstacles in a quest to achieve the fastest possible time across the finish line. You can choose to race alone or against CPU-controlled opponents (Selection A or Selection B). The other racers in Selection B are little more than obstacles to avoid. There are no places, the other riders are just there to slow you down. Avoiding them adds a new level of challenge to the racing, but is not quite the same as competing against opponents in most modern racing games. There is some technique involved in getting the fastest possible time. Pressing left or right will cause you to learn forward or backward, and the key to maintaining momentum is landing as parallel to whatever obstacle is beneath you as possible. Those who mastered this skill back in the 80’s will find it quickly coming back to them. Those who are new to the series should find it fairly easy to pick up. The “A” and “B” buttons are the accelerator and the turbo. Lean too heavily on the turbo and you’ll cause your bike to overheat and you’ll have to dismount temporarily while it cools down. The key to achieving the fastest times lies in the balance between turbo and normal acceleration. With 3D in the title of the game, one would assume that the graphics are an important part of the experience. The developers at Arika have done a fantastic job of preserving the graphics of the original while still adding a 3D twist. Turning the 3D control all the way down results in a perfect recreation of the original game. Turning it up gives you enhanced perspective, offering a better view of the stadium and the sky beyond it. I found myself idly switching between 3D and 2D, just to enjoy the way the perspective shifts. Beyond the shift to 3D, the graphics are very much 8-bit sprites. From the camera guys on the sidelines to the weird infield spectators, one of whom is always standing while the other crouches down, playing this game is like looking back in time. Today’s gamers are well-accustomed to creating their own in-game content. Back in the NES days, however, it was completely unheard-of. Excitebike was one game that actually allowed you to play with some of the game developers’ toys. The design a track mode, my favorite feature of the original, is back in the 3D re-release. Players can use any of the elements from the Nintendo-designed tracks to create their own monster courses. The interface has been redesigned to work with the touch screen and seems to be intuitive enough. One well-appreciated improvement over the original game is the ability to save your custom tracks, up to a total of 32 different creations can be stored in the system memory. User-created tracks can be raced both in Selection A and Selection B mode. Right now, the game is available for free on the Nintendo eShop. This offer lasts until July 7th. Afterward, the game will still be available, but for a price. If you can get in before the free offer ends, I whole-heartedly recommend you download this title. If you’re a little late to the party but still considering plunking down your hard-earned cash for 3D Classics: Excitebike, my advice to you differs depending on the decade in which you were born. If you have fond memories of the NES era and want to play a title that is actually just as fun to play as you remember, then you’d be hard pressed to find a better game than this one. If you grew up in the era of Playstation, it’s a bit tougher to appreciate. The gameplay is simplistic, but fun. It’s not in any way as sophisticated as the games you’re used to playing: The backgrounds are repetitive and the CPU-controlled players posses no logic whatsoever.